» Forum » Tech » Tech: Alpha-numeric » System 80b how to measure oscillator frequency? » System 80b how to measure oscillator frequency? System 80b how to measure oscillator frequency? I have a system 80b (genesis) that is not booting. I havent used an oscilloscope much at all before but i borrowed one to measure the crystal oscillator and data/adr lines on the cpu. 5V is up and working. When I measure on Z3 pin 6 i get a reading that jumps between 330khz and 600khz. I thought that i would get a reading of 3.57mhz here, if i measure after the Z2 divider on pin 8 I get 330khZ steady where i would assume i should have 900khz. Since I havent used an oscilloscop much before i was wondering if someone could verify that i should have 3.57khz coming out of z3 pin 6 or 900khz coming out of z2? If you have an unstable clock signal, the first thing to check is that the bandwidth of the scope is sufficient! some small, cheap device are just good for measuring audio signals. There we are at almost 4 Mhz, so we need a scope that supports at least 10 Mhz to have a usable trace. If it's good, you have to check that the circuits Z2 and Z3 are correctly powered. The feed track goes under the battery, and often, following leakage and oxidation, the power is cut. It is very rare, but sometimes we have seen broken, flawed quartz oscillating at strange frequencies. And in the series "weird" we also have once, a 7474 which divided by 3! but hey, if already the frequency is not good at the entrance of the 7474, we must look for the problem either on the side of the Z3 (7404) or on the side of the quartz. Something to check is if the original 7404 has been replaced: because if you put a "LS" or an "HC" instead, the oscillator may have trouble starting. Thank you. There seems to be nothing wrong with the clock signal, just with my oscilloscope skills.. =) I managed to get it working now though and it looks exactly like your image! More problems.. I still have trouble getting the MPU to successfully boot. With the reset board connected it just goes in to a reset loop. I can se pin 40 going up and down. With the reset board disconnected pin 40 reset is stable at 4.5V. Pin 2 is 5v and Pin4 IRQ is 0.165v.. I've checked pin 25 on the RIOT chips and they are all 0.165v. Any idea what might cause this? If i have the reset board connected i can see pin 4 IRQ going high and low but maybe thats just because of the constant reset the board does. I'm far from knowledgeable about this stuff, but where are you disconnecting the reset board? I remember reading that the cable stays connected to the MPU & the unplugged at the reset board. Something to do with a diode or something. The reset board is monitoring the IRQ signal. If this one is not providing pulses, the reset board will reset the 6502. This is the behaviour you are experiencing now because of the stuck IRQ signal. You can disconnect the resetboard while troubleshooting the CPU board. The IRQ signal is stuck low....many times this is an indication one of the RIOT chips is defective. To determine which one, a testrom is a big help. I can send you testrom binaries if needed. Also….the early system80B boards many time have problems with the piggybackboard carrying the PROM1 gamerom. They suffer from cracked solder joints many times causing instable behaviour of the CPU board. Test roms would be a big help! Thanks. Do you have an instruction for them also? Send me a PM with your emailaddress and I will send you the testrom binaries and instructions. I will try the test rom this weekend, thanks. If it is one or more of the RIOTs, which ones should i get, i see there's lots of R6532P and R6532AP on ebay from china. Does it matter if i get the P or AP? No, actually the continuity table on Pinwiki is not valid because in SYSTEM 80B the EPROM 2764 (A1) does not have the same pinout. For R6532P and R6532AP, it is compatible and interchangeable on all SYSTEM 80/A/B because the CPU frequency is only 895 Khz (not even 1 MHz). In the absence of marking, the maximum frequency of the 65xx series circuits is 1 MHz. A letter "A" indicates a 2 MHz version and a letter "B" for 3 MHz. 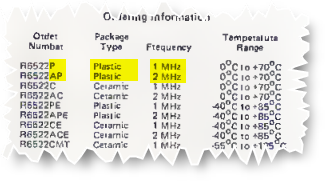 The "P" indicates a plastic case, while a "C" will indicate a ceramic case. Attempting to troubleshoot a Gottlieb board without a test bench is very risky and the result is very uncertain. A test ROM can help, but you still need the CPU board to start. As @maralb said, the IRQ signal that remains at zero often comes from one of the 3 RIOT 6532. Yes, but determine which is sometimes very difficult. The circuits being soldered, it's a bit of a lottery. About the 6532 that are found in the trade (and not only from China, this is valid even for famous stores): they are obsolete components, no more manufactured, and it circulates on the market of very doubtful lots. We ourselves systematically test all components with our "home" test bench. I have already seen lots with 50% of circuits having faults. So mistrust in mounting components: it is not because they seem "new" that they will necessarily work well. I managed to get the test rom running and it halts at U5. I've ordered new RIOT chips (China) and hopefully they're not faulty then..
Just an update, I installed the new RIOT into U5 an after that the test rom ran through all the tests just fine, my game is booting up fine now. Display, sound and almost everything seems to work! Well done! Thanks for the feedback. If I'm going to have some System 80 about I should pickup some test roms as well. Still waiting for parts to arrive to fix my Gold Wings. Sound stopped working the other day to add insult to injury, but I'll wait till the parts arrive to fix problem one before investigating problem two. One could very well be related to the other and no sense losing more hair chasing a problem which might resolve itself. Ground mods and some caps replaced seem to have made the display happy, so I got that going for me. So far it has been very trying- Broken wiring, malfunctioning driver board, second driver board defective, display issues. EM only machines again starting to look attractive. Thank you for everyone who contributes to these threads, it is a great learning experience.